…We left our hero coming to the aid of a damsel in distress. The evil double-glazing empire had dispatched an army of horny, if slightly retarded, window fitters to steal her virtue, but had been cunningly repelled by the use of reverse psychology (essentially pretending to be gay). A great victory had been won, but not without cost. One of the windows had fallen at the hands on some conniving chipboard and now lay vulnerable to attack. The testosterone-filled rascals had vowed to return and finish what they’d started. Our saga continues…. I rang off, putting the whole thing down to simple miscommunication, but ohhhh noooo, larger calamities were afoot. An hour or so later the phone was ringing once more. I began to consider the possibility that I was dealing with one of mankind’s more primitive ancestors. An idea for testing this hypothesis occurred to me. I’d used the company before and had no qualms leaving two likely lads to install some double-glazing while I headed off to work. By midday the phone was flashing with my housemate’s name. Later that evening I returned home to survey the damage. Whilst my housemate is a very attractive woman by all accounts she isn’t that way inclined. So, even if the fitter hadn’t written his note on a piece of toilet paper and had remembered to include his name, he’d still have had no chance. A more pressing question presented itself – How did he know that we weren’t in a relationship? This morning I rang the company and gave them what-for middle-class style. 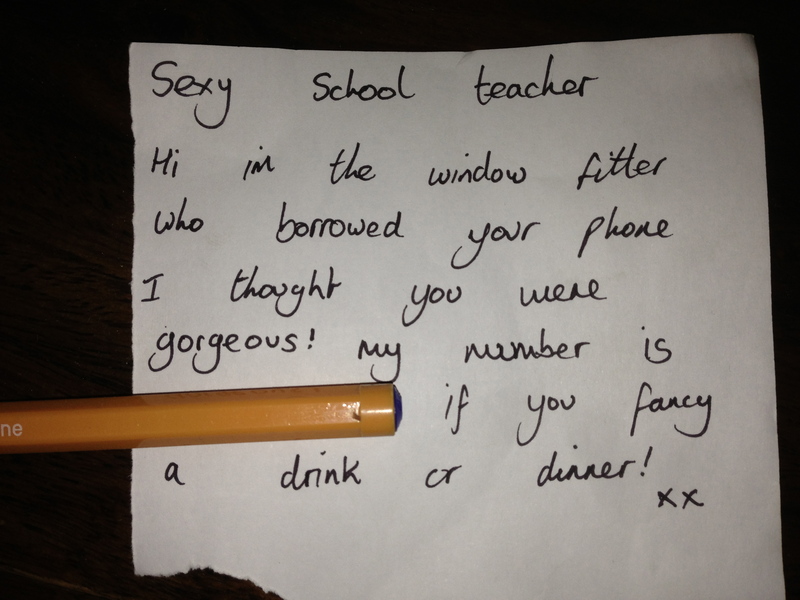 Later I borrowed the above note and phoned the given mobile number.